Visual Question Answering (VQA) task has showcased a new stage of interaction between language and vision, two of the most pivotal components of artificial intelligence. However, it has mostly focused on generating short and repetitive answers, mostly single words, which fall short of rich linguistic capabilities of humans. We introduce Full-Sentence Visual Question Answering (FSVQA) dataset, consisting of nearly 1 million pairs of questions and full-sentence answers for images, built by applying a number of rule-based natural language processing techniques to original VQA dataset and captions in the MS COCO dataset. This poses many additional complexities to conventional VQA task, and we provide a baseline for approaching and evaluating the task, on top of which we invite the research community to build further improvements. 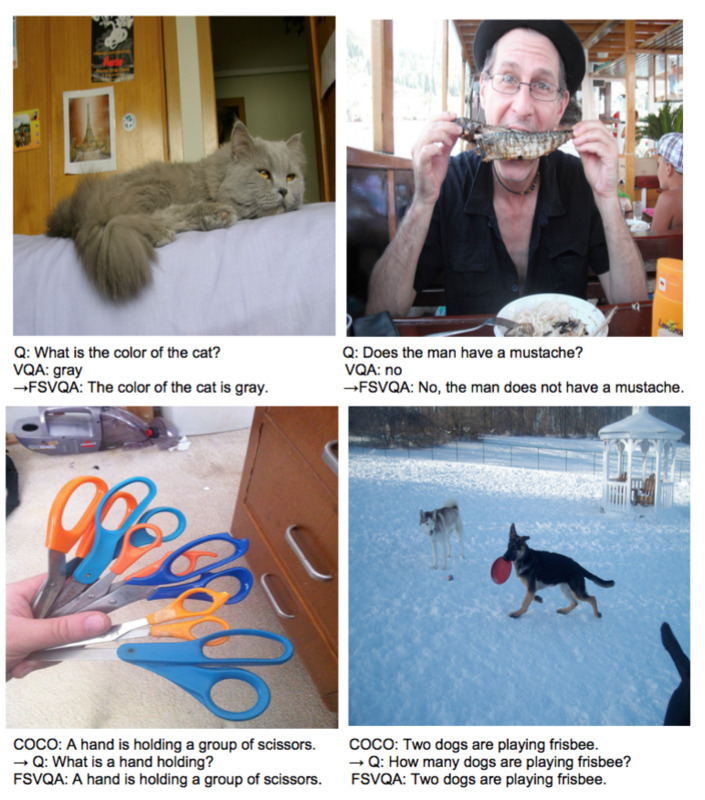 Andrew Shin, Yoshitaka Ushiku, Tatsuya Harada, ”The Color Of The Cat Is Gray: 1 Million Full-Sentences Visual Question Answering (FSVQA)” arXiv, 2016. Features are for the labels appearing more than once, as described in the paper. You can download the images from MS COCO, and check out the original VQA dataset, code, etc. from VQA.